This rock shows veins of sediments that scientist believe were deposited under water and was an environment once hospitable to life. Editor's note: Jim Bell is a professor in the School of Earth and Space Exploration at Arizona State University and a member of the NASA Curiosity Mars rover camera team. He is the president of The Planetary Society and author of "Postcards from Mars," "Mars-3D," and "The Space Book." (CNN) - An announcement on Tuesday marked, quite literally, a watershed moment in the history of solar system exploration. 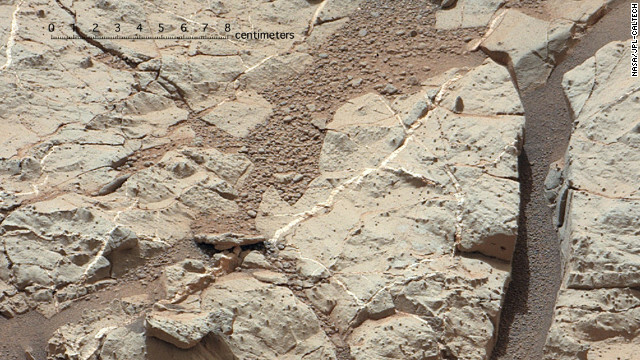 NASA scientists said an analysis of drilled rock samples collected by the Curiosity rover shows that ancient Mars could have supported living microbes. It is the first time that we've discovered actual evidence for fresh water on another planet. We've been down this watery path before - sort of. Back in 2004, NASA's Opportunity rover found evidence of ancient water on Mars.